Kid Rock’s plan to run for U.S. Senate might be hitting a bump in the road: it’s not immediately clear if the singer’s stage moniker would be allowed on the ballot. He might be required to run under his far less-recognizable born name, Robert Ritchie. According to Michigan law, candidates cannot use any “nickname that is not a recognized diminutive of the candidate’s given name.” However, if Ritchie is able to gather enough signatures to make the ballot and indicates he wishes to run under his stage name, the Michigan Bureau of Elections would have to research whether or not “Kid Rock” would be allowed. Ritchie announced his plans to run via Twitter last month. 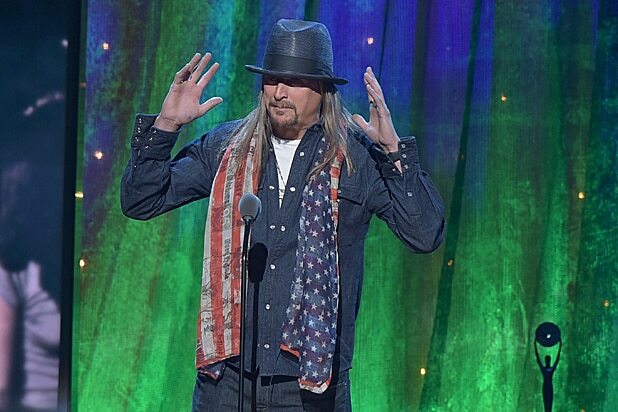 “I have had a ton of emails and texts asking me if this website is real… http://kidrockforsenate.com The answer is an absolute YES,” he said under his stage name. Ritchie, who initially supported Ben Carson in last year’s presidential race before switching his allegiance to Donald Trump, performed last August at the Republican National Convention in Cleveland. In April, he also joined fellow musician Ted Nugent and former Alaska Gov. Sarah Palin for a visit to the Trump White House, where they tweeted a shade-throwing photo of themselves in front of a portrait of former first lady Hillary Clinton.